The Yankees won 6-2 over the Rays at Tropicana Field, snapping their six game losing streak. Ivan Nova had another solid start, which was his fourth quality start in his last five. Alex Rodriguez and Jorge Posada showed signs of a resurgence in the win off of James Shields. That was Rodriguez’s 59th multi homer game of his career, which gave the Yankees a 2-1 lead in the top of the sixth. He had recently been struggling having gone 1 for 13 in his last three games. Posada was able to come back from his three day self-imposed hiatus with two hits. This was much needed based on his very disappointing start to the season. 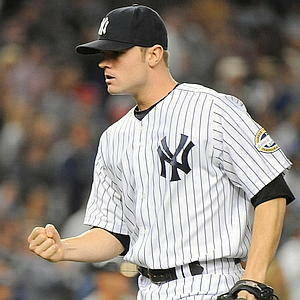 The turning point in the game might have been David Robertson’s two straight strikeouts of B.J. Upton and Casey Kotchman after he came in with one out in the sixth after Nova was taken out of the game with the bases loaded. Even though the offense showed signs of a resurgence, Robertson is the player of the game because he entered the game in a pressurized situation and was able to get out trouble. The 26 year-old hurler now has an impressive 26 strikeouts in 16.2 innings. He was able to secure the win for the starter which the bullpen or offense had been unable to do many times so far. During the top of the seventh, with the Yankees only up 2-1, Gardner showed guile laying down a perfect bunt for a single with Evan Longoria playing back, to advance Posada to third. This was crucial because the Yankees have not been bunting well at all this season. Then Chris Dickerson, who got called up today because Rafael Soriano was put on the DL, and arrived just before the game, hit a clutch single to score Eduardo Nunez who was pinch running for Posada. In the ninth inning Nunez was able to lay down a successful sacrifice bunt to put Russell Martin into scoring position. Gardner was able to capitalize on Martin being in scoring position adding another hit with a runner in scoring position. There were only a few negatives in this much needed victory. Robinson Cano committed his third error in the field after only three errors during his Gold Glove 2010 campaign. He should be able to revert to his 2010 form and cut down on his defensive miscues. Even though Derek Jeter was able to add on an insurance run with a two out RBI single in the ninth, he was otherwise 0 for 4 with three strikeouts. Hopefully this is the game that turns the offensive production around, and this victory is even more meaningful because it came off of James Shields who came into the game with a 4-1 record and a 2.08 ERA. The Yankees were able to salvage a much needed split during this brief two game set in Florida as they head to Baltimore to face the talented young hurler Zach Britton tomorrow night at Camden Yards. With the split of the two game series, the Yankees are still two games behind the Rays and are only two games ahead of the last place Orioles. The AL East appears to be more balanced than it has been in a long time which proves how valuable all the division games will be this season.